Book 5 or more day trips with us and receive a 10% discount on the total price of your Phuket day trips, book 3 or 4 day trips and receive a 5% discount. You do NOT need to pay the full amount in advance when you book your Phuket dive daytrips with us. We require only a deposit to confirm your booking, and the balance is paid on arrival. 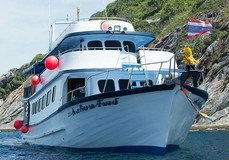 Phuket scuba diving day trips normally start with your hotel pick up at 07:30 hrs, and return to your hotel at 18:00 hrs, but will vary depending on the dive site distance and the number of dives in the day. Dive boats normally leave from the pier at Chalong Bay in Phuket, or Tap Lamu in Khao Lak. Boat journey times range from 1 to 3 hours. 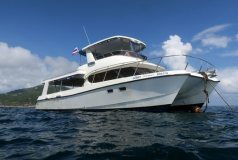 Rest assured, you'll be diving from only the best daytrip dive boats available in Phuket, both in terms of comfort and service, with a maximum of only 25 divers on board. For more information visit: Phuket dive sites. Phuket hotel to/from boat transfers (Patong Beach, Kata and Karon areas only), breakfast, lunch, drinks, dives, weights and weight-belts, tanks, professionally qualified divemaster for every 4 divers (free private guides for groups of 2 or more divers on daytrips to Racha Yai, Racha Noi or Phi Phi Islands), accommodation on overnight trips, and taxes. Full set of rental dive equipment US$ 19, dive computer US$ 8, dive insurance. Similan National Marine Park fees of about US$ 22 are not included. Private dive guides for individual divers can be hired for US$ 47 per day. Unless otherwise stated, all the listed items need to be paid on arrival. There are no hidden extras in the trip prices quoted to you. Diver experience: All guests must have dived within the last 12 months or have at least 20 logged dives to join day trips to the Similan Islands and Koh Bon. It is also recommended that guests are Advanced Open Water Divers or have dived in the past 6 months and have at least 25 logged dives to join trips to Kingcruiser Wreck. 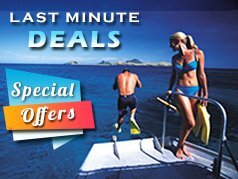 Non-divers and snorkellers from US$ 82 per day. Don't want to dive in a crowd? Want freedom to dive exactly when and where you want? Charter your own boat! A charter is an excellent idea for dive clubs or groups, but you are welcome to charter the boat for just a few divers if you wish. Having your own speedboat means you can be first at the dive sites (if you want to start early), or you can have a lie-in and still enjoy a full days diving. You'll also get time for a relaxing lunch and a bit of sightseeing. The speedboat we offer is specially designed for diving, with space for tanks and gear, an onboard head and shower and plenty of room for relaxing with a maximum of only 10 diving guests. Phuket hotel transfers, soft drinks, drinking water, dives, weights and weight-belts, tanks, 2 divemasters and all taxes. Similan National Marine Park fees of about US$ 22 per person are not included. Lunch on charters is extra approx. US$ 16 per person - a special picnic on the beach or packed lunch can be arranged, or you can dine at 4 Star hotel resorts on Phi Phi or Racha Yai trips. The whole boat charter is for up to a maximum of 10 divers. If you have a smaller group, 3 dives may be possible for the same price. 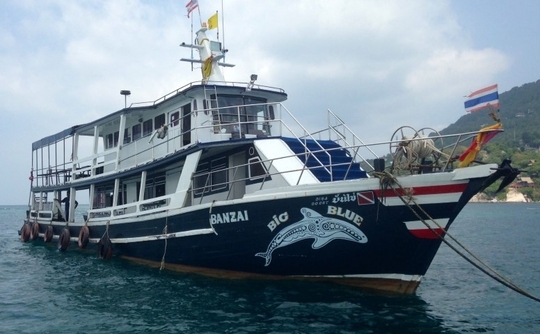 If the charter is for the Similan Islands or Hin Daeng, then 2 dives is the maximum. Trips to the Kingcruiser Wreck / Shark Point / Anemone Reef area include dives at any of these sites - it's your choice. Trips to Hin Daeng in low season may be possible but cannot be guaranteed. Full sets of scuba equipment US$ 19, computers US$ 8 per day.